Click here to check out all of our Mexico offers. Mayan Palace Riviera Maya near Cancun, Mexico - Buy a 7 Night Stay in a Master Room! 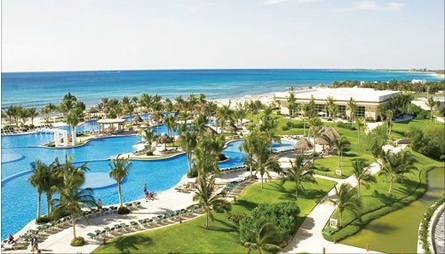 Enjoy a 7 Night Stay at the Mayan Palace Riviera Maya near Cancun, Mexico! Mayan Palace is a luxury destination on the exclusive Riviera Maya, just 15 minutes from the town of Playa del Carmen. From here you can take the ferry to Cozumel Island, sunbathe on the white sand beach, swim in one of the many relaxing pools, or catch a charter for some deep sea fishing. Golfers have access to our 18-hole Jack Nicklaus-designed course. Internationally trained and acclaimed chefs also serve up an array of tasteful creations daily. The exclusive Mayan Palace Riviera Maya is located just 15 minutes from the town of Playa del Carmen. Take the ferry to lovely Cozumel Island where you can enjoy a beach massage, sight see around town, learn about the ancient Mexican art of making Tequila, or learn to cook delicious Mexican food. Or stay close by and sunbathe on the white sand beaches, swim in the sea, or practice all your favorite water sports. The Mayan Palace Riviera Maya has decorated each spacious room with unmatched style, creating an atmosphere of distinction and all featuring a marble bathroom and many other amenities. These rooms are located throughout the resort so the view from each one is equally breathtaking. Each room has a private outside terrace where you can watch the sun set every day. Inside, the two full beds share direct views of the television and the outside, and there is ample space in the bathroom. This room is ideal for couples, with additional space for two children under 12. The Following Check-in Dates are Available for a 7 Night Stay!